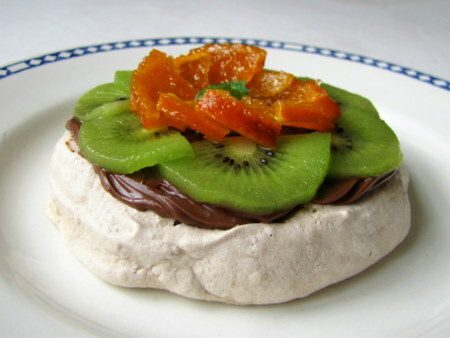 Daring Bakers Chocolate Pavlova ~ I Can Do That! The June 2010 Daring Bakers challenge was hosted by Dawn from Doable and Delicious. Dawn challenged the Daring Bakers to make Chocolate Pavlovas and Chocolate Mascarpone Mousse. The challenge recipe is based on a recipe from the book Chocolate Epiphany by Francois Payard. I've seen recipes and photos of pavlovas but have never eaten nor tried to make them. I love meringues whether they are crispy, soft, or mixed with ground nuts and it was good to find out that the Daring Bakers are challenged to make pavlovas. I changed the original recipe using just a quarter of the cocoa powder, omitted the confectioner's sugar, and baked it for a little over 1 hour which is half the recommended baking hours. The meringues came out crispy but still a little soft inside. I liked it. The recipe also calls for a mascarpone sauce that has 6 eggs yolks but I thought it was too rich. I'm sorry Dawn for not making the sauce this time. I will make it for another dessert because it sounds absolutely divine. I made another one with slightly more chocolaty meringue but made a lighter mousse. 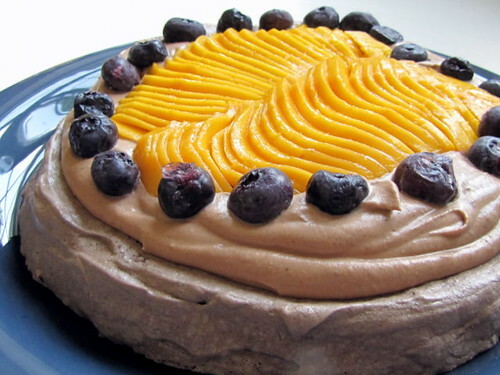 I topped the cake with sliced mango and blueberries. This one has a more pillowy interior. I liked it too. This one is my favorite, a plain vanilla meringue shell topped with sweet strawberry halves and slightly sour sliced kiwifruit. I followed Audax's recipe which is very similar to the one in my British desserts cookbook. The shell has a crispy almost crackly exterior with soft marshmallow innards, is light as feather and has melt-in-your-mouth quality. Super-duper delicious! Very meticulous and detailed job. Well done! You made 3 versions exquisite effort I really like the mango one well done it looks marvellous. Thanks for linking to my blog your vanilla classic pav looks perfect I like how you placed cream on the sides which makes it look so elegant. Cheers from Audax in Sydney Australia. Wow, I'm impressed with your 3 variations. My favorite one is the pavlova with mango and blueberries - YUM!!! Good job! I think I actually just hit my tooth on my computer monitor while I was trying to sink my teeth into that mango pavlova!! All of your pavlovas look amazing! Fantastic job! Beautiful fruit pavlovas! Great job ! WOW, three pavolvas and each of them look so beautiful :-) Nicely done! Your pavs are gorgeous. I also topped mine with mango as its the season for them where I live. Oh wow all 3 look delicious but i agree the plain meringue with the strawberries and kiwi looks so good!! I liked how your candied the mandarin oranges. All of your versions are wonderful. Oggi, they are gorgeous...love how you decorated...beautiful! 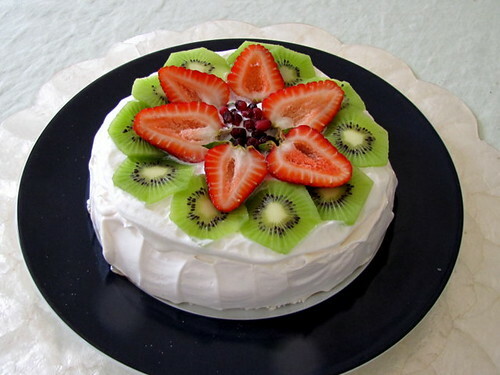 I'm loving the fruit on your pavlova, looks deliciously heathly! oggi, after seeing your completed challenges in the DK forum..I had to pop in and tell you how amazing your creativity and pastry work is! I only wish I could slice and arrange fruit half as lovely as you do! Beautiful pavlovas..all three preps!